Drugs Have No Place In My Future! On Thursday, Mrs. Jones' first grade class participated in "drugs have no place in my future" for Red Ribbon Week. Students dressed up like their future self. It was so fun to see the students dressed up! Don't Get Mixed Up With Drugs! On Wednesday, Mrs. Weight's fourth grade class participated in Red Ribbon Week. Students had mismatched clothes on for “don't get mixed up with drugs.” Students had a great time showing off their crazy clothes! Rally In Red For Red Ribbon Week! Mrs. Mathis and Mrs. Lacrua's third grade class participated in Red Ribbon Week. Students wore as much red as possible for "rally in red." It was so much fun to see all of the red throughout the school! Follow Your Dreams- Don't Do Drugs! Mrs. Moody's second grade class participated in Red Ribbon Week. Monday was “Follow your dreams- don't do drugs.” Students had so much fun wearing their pajamas for the day. We are excited for the themes for the rest of the week! Mrs. Chambers' 3rd graders had a chance to bring in their collections to share with the class. They read a story called Max’s Words which talks about a boy who starts a collection of words and creates stories. The kids used the chrome books and google classroom to type an essay about their collection so their classmates could read about it. It was a fun time learning and sharing our collections with each other. A Great Big Thank You from Riverview!! Our chalk-walk was a huge success. We are collecting pledges this week, Oct. 9th-13th. Our school goal is $8,000. Yesterday was Columbus Day. On Columbus Day, I used to tell my students about the discovery of America. Everyone knows the story, of course – how Christopher Columbus sailed the Nina, Pinta, and Santa Maria in 1492 in search of a shorter route to the Indies. Columbus kept a log during his voyage. He reported that when the wind was strong, his ships made a lot of progress. When it wasn’t, they made very little. As the weeks went on, the crews grew restless. Storms brought trouble. Supplies became limited. Some of the food went bad. I can’t help but think how much Columbus’s famous voyage parallels with life at Riverview. In the beginning of the school year, teachers set their course. Some days we make a lot of progress. Some days we don’t. Our crews get restless, too. Rain can spoil recess. We run out of supplies. Fruit flies infest abandoned lunch boxes. And students face unexplored territories and make new discoveries daily! The sign-up for session 2 will be available on Tuesday, October 17th. If your student was unable to attend a club last session you will have first priority at 7:30 a.m.; all others may begin registration at 7:50 a.m. Thank you for supporting your children and attending conferences. Also, thank you to the PTA for providing dinner on Thursday evening. It was delicious and very much appreciated! A Great BIG Thank You from Riverview!! Our Chalk-Walk was a huge success. We are collecting pledges this week, Oct. 9th – 13th. Our school goal is $8,000. GO RAMS!! This week we are celebrating Red Ribbon Week; October 9th – 13th. Red Ribbon Week serves as a vehicle for communities and individuals to take a stand for the hopes and dreams of our children through a commitment to drug prevention and education and a personal commitment to live drug free lives. Listed are some of the activities that we will be involved in. The Riverview Annual Halloween Costume Parade will be held on Tuesday, October 31st at 9:00 a.m. The parade route will be around the sports park directly across from the school. The parade line-up will be from the youngest grades to the oldest grades. Afternoon Kindergarten will hold their parade at 12:30 p.m. around the Kindergarten playground. I would like to thank Mrs. Sharla Thomas, Mrs. Kelsey Mortensen and Miss Jessica Larsen for making a spoooooky Riverview RAM scarecrow as an entry in the Spanish Fork City Scarecrow Contest. Riverview Elementary is ‘Making a Mark.’ Drive past Central Bank to view our entry. Don’t forget to vote for our scarecrow. The winner gets $100 and bragging rights! Vote for Riverview's Scarecrow entry in the Spanish City Scarecrow Contest! Winner gets $100 and bragging rights! 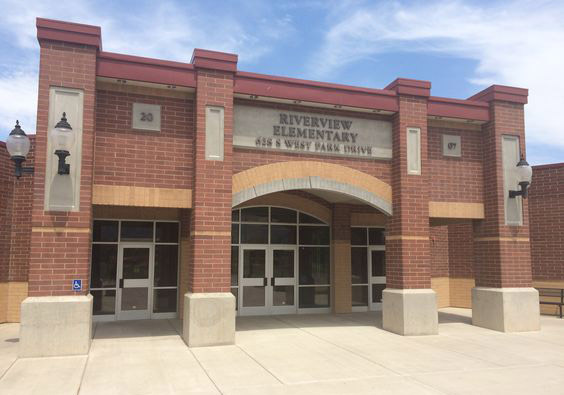 Riverview is Making a Mark in Spanish Fork! PTA will be passing out treats to all those kiddos who are wearing their school t-shirt on each Popcorn Friday.